Ever since the development of penicillin as an antibiotic in the 1940s, there has been an interest in understanding the chemistry, biochemistry and genetics of the biosynthesis of penicillin and other β-lactam antibiotics. Of course, the main interest was with Penicillium chrysogenum and Acremonium chrysogenum (formerly named Cephalosporiwn acremoniwn), which have always been the commercial sources of these antibiotics, but in the late 1940s, screening of a wide range of fungi for new antibiotics led to the detection of penicillin production by Aspergillus nidulans (Dulaney, 1947). 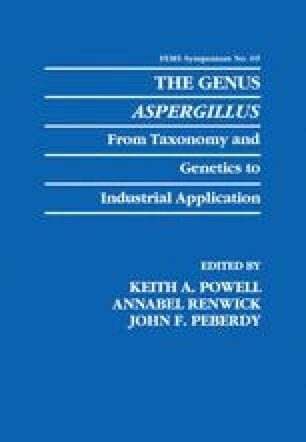 Although this has never been of any commercial significance, the development of A. nidulans as a model organism for genetic studies (Pontecorvo et al., 1953) led to its occasional use in projects to investigate the genetics of penicillin production (Ball, 1983).